Speed humps make people drive faster? The ‘affordable apartments near light rail’ are actually 0.6 miles, or a 12-13 minute walk (per google maps) from Rainier Beach station. Swedish Hospital is 0.7 miles from Pioneer Square Station, per google maps. Under this logic, I guess we can say First Hill is already well served by Link? There’s also a significant hill between Swedish and Pioneer Square. The affordable housing near Rainier Beach Station is fully 15 minutes away, at normal urban walking speed. And the route goes through some pretty rough areas of SE Seattle. Yeah, it really isn’t within easy walking distance of a light rail station. It is right by the 7, though. If and when Seattle finishes their planned RapidRide improvements, it will be a short, fast, frequent bus trip from there to the Rainier Beach Link station. This proposal will eliminate one of the trashiest corners in the Rainier Beach neighborhood and create some much needed housing. If a pedestrian trail could be built between Dunlap and South Lake the walk time to RBS would be much quicker. Hey, that looks very similar to the latest revisions to the One Center City plan! There may be enough bourgeois pretension in Seattle when it comes to dining that a “sushi tax” might go a long way to cover a sufficient amount of low income housing? How about this? Public works program hiring people at living wages – which will return them to the tax tolls- to fix whatever’s broken and mop whatever’s dirty in Seattle. Anybody sees a scarcity, get off LINK at IDS, and note carefully the well-below-standard public art on every tile and stone. Filthy mess whose like I’ve never seen since DSTT opened in 1990. Will Seattle’s new privatized company take care of that? Also anybody put out of a home of ten years’ dwelling or more, hired to stay as paid caretakers. For starters. Paid for by fairest taxes possible: Residential Real Estate Speculation and Evictions Tad. Since in addition to our voter registration, Seattle loses former residents’ taxes, only fair that those profiting from the “Real Estate Market” , repay the city for their share consequences of those proceedings. Only one change of ballot language. Don’t call it a tax. Call it a bill. Build homes on vacant county land, sell bonds to cover construction costs, recoup costs with sliding scale rents, collect underpants, profit. Being homeless usually comes after defaulting on a lease. When a person loses their job they often get behind on their rent and their credit rating goes to hell. With a low credit rating and a record of lease default, it’s hard to apply for an apartment, even with a $15/hour job. Most homeless people wouldn’t be offered a lease, even with a full time job if they have a derogatory credit history. There are plenty of large companies in Seattle that are willing to pay $15/hour but they can’t find applicants. Maybe some of the large companies that were fighting the head tax and are also currently looking for workers could get together and create a plan to guarantee that landlords would get paid current rent in exchange for forgiving past debts. Could a program be developed where large employers like Amazon and Starbucks offer lease guarantees to landlords (direct deposit into the landlord’s bank account) for formerly homeless individuals in exchange for “reasonable” rent and forgiveness of past debts? Essentially, Amazon or Starbucks would rent the apartment for 1 year and deduct the lease amount from the paycheck of the formerly homeless person. I like the idea in principle. But, what happens if the employee gets fired after one month? Is the employer stuck footing the apartment bill for the employee that isn’t working there? Or, do the payments stop, and the person gets evicted? If it’s the latter, then maybe the landlord doesn’t rent to that person because the rent is still not actually guaranteed. I made it to the MLT openhouse yesterday, here are some things I heard. Build will be handled in 3 contracts, 1 Southern half 1 Northern half,, and the third will cover Power, control, etc over the entire build. The crossing of I5 in MLT will be built over falsework similar to the work being done in Bellevue over !405. Revenue date is July 1 2024. the schedule includes 6 months of slip time. I’d also like to apologize to all of the people representing ST, CT, City of MLT, etc. who were there and had to deal with the Crackpot after the speeches were finished. I can’t see any use for the MLT freeway station after Link is open. In order to use it, buses would have to proceed SB on I-5 and exit at 175th to turn around. Any service south of that is redundant (unless CT or ST begins express service to Greenlake or Ballard or areas west of I-5, which is highly unlikely). Maybe Greyhound could stop there between Seattle and Vancouver. Some people might find the Link connection an attractive alternative to backtracking downtown. It makes sense for any city-to-city bus (like a Greyhound). Lynnwood is a better stop from a geographic standpoint because it has more connections (while only being a bit farther north) but the time penalty is a lot bigger, so stopping at Montlake Terrace just makes sense (might as well, really). The thing is, it is a bad truncation stop. For an I-405/525 bus, I think it makes more sense to just use the regular (right hand) general purpose exit for Lynnwood. In other words, if a bus isn’t in the HOV lane already, then you might as well take the first exit and end there. The time spent moving over and then moving back is just too much. There aren’t any HOV exits after Mountlake Terrace until downtown (unless I’m mistaken) . So that means that unless you want to go all the way into downtown Seattle, it really isn’t worth it. It only makes sense if they plan on sending that bus to Seattle (or beyond it) as would be the case with Greyhound. But do you really want to spend that much time for a bus from Mukilteo, given the fact that it struggles with headways? I seriously doubt it. While those type of buses are common in big cities, I just don’t see it once Link gets to Lynnwood. I could easily see an Everett to Lynnwood express bus, even when Link gets to Everett. It would skip several stops, and would — for many riders — involve the same number of transfers (assuming it served part of Everett before getting on the freeway). But doing the same between Lynnwood and Seattle is very problematic. To begin with, Link is very fast. The omission of key stops (like First Hill) and stops in general (nothing between 65th and Northgate) means that it will be quite fast for a subway. The HOV lanes are decent, but bog down getting into or out of downtown. When the express lanes reverse, it is worse. So that means that you have a short window where it would represent a substantial time savings, and there really aren’t that many people interested in that trip. Can you justify a Snohomish County to downtown Seattle express (stopping at Montlake Terrace) if it runs from 10:00 AM to 11:00 southbound, and noon to 3:00 PM northbound? I really doubt it. The other possibility is to try and pick up something that Link doesn’t, close to downtown and an express lane exit. This seems possible. Maybe a First Hill bus that exited at Fifth and Columbia (itself a worthwhile leap frog of several Link stops) then turned up the hill and served Harborview and Seattle U. That’s an HOV only exit, which helps. Mercer Street is the only other thing that seems plausible. While the exit is general purpose, you could hook into the (future) HOV lanes on Fairview, and then cut over to serve South Lake Union, or even the Seattle Center. It still seems unlikely that a bus like that wouldn’t serve Lynnwood but would manage to go by Mountlake Terrace, though. My guess is a bus like that wouldn’t even serve Snohomish County, but would start at Northgate, or better yet, Ravenna (i. e. 65th). That means the value of the Mountlake Terrace HOV ramp (as wonderful as it is) will likely be placed on the ash heap of transit improvements, alongside things like the Northgate HOV entrance. Yeah, maybe it is used once in a blue moon, but in general, its time will have passed. I could see it used by employee shuttles, like MSFT, Expedia, and Children’s Hospital. An Expedia shuttle that starts at Lynnwood TC and stops at the freeway station along the way to/from Interbay seems logical. But if I’m, say, Children’s Hospital, I think I’d rather just run frequent shuttles to/from the U District station and let people figure out how to take Link to UDistrict. A peak-only SLU service might make sense, but I don’t think CT or ST has the appetite to burn services hours on Mercer street and I5 congestion. I can definitely see the intercity Greyhounds & Bolt bus use it – the time savings of a freeway station vs. exiting the freeway at Lynnwood are probably very appealing for long-haul buses. Chicago chooses a stripped-down hyperloop for a high-speed airport connector. Called “Loop” and consisting of 16-passenger pods, Elon Musk’s proposal would connect O’Hare and the Loop in 12 minutes at a $20-30 fare, at a top speed of 150 mph, and would be built with private funding. This technology won against three other proposals including high-speed rail. I think the O’Hare el line takes 45 minutes to the Loop. You mean the Blue Line? The normal, everyday rapid-transit line which happens to have been extended to O’Hare? Any point-to-point train will be faster than that. Steam engines, giant fans, and barrels…..by 1865, none of them proprietary, all mechanically well-understood, heat, dirt, and abuse resistant, and experienced technicians always upstairs at huge basement tavern eating roast oysters. Different fireplaces, different wood, different flavor. Like hickory. One ex-Chicagoan to two guys who need to try a little harder: One of you, resign, before your deceased constituents start taking matters into their own hands, rather than contracting out collecting their voting information off tombstones as in honored tradition. Chicago never denied a loyal Democrat the right to vote on the flimsy irrelevance of his being dead. And Elon, a small public-spirited contribution to the Chicago Transit Authority will grant you ten years in the seat of motorman’s cab around the “Loop”, and letting you put the throttle down on a force nine quake headed for Howard Street multiple times a day. Because if you don’t have a motorman’s feel for the messages conveyed by heat, noise and dirt, however microscopic, maiden voyage will paint your shiny walls with your passengers all the way from the airport to the loop. Uh….has anybody seen any of your track-cleaning equipment at all? Recent extraterrestrial experiments with your rolling stock don’t change the fact that a Model T would’ve handled Outer Space a hell of a lot better than a Tesla could handle the subway under State Street or the structure depicted here. Which Chicago and North Shore, as you see, took a giant streetcar with a restaurant around it no questions asked. But now Teslatrain finally has got a home. Something in yesterday’s news about our country’s new little friend who’s going to help us defeat Canada…well, since it’s going to be a present when de-nuclifies the Korean Penninsula, plenty of time to get a station built in a hotel basement. That just seems to have slime written all over it. A deal between one of the most corrupt politicians in the U. S. and a technological megalomaniac involving an unproven technology to deal with a problem that mainly serves the impatient wealthy. What could could possibly go wrong? Who ought to appear in a shower of chartreuse sparks with a signed order from Emperor Franz Ferdinand to either show up in Vienna to learn how to build streetcars before WWI destroys the Empire, or change the car’s name to the Rahm Emmanuel. Second worst thing is not going to happen, because I think there’s even less chance of Elon building a single block of it than of Kim Jong Il using nuclear weapons on anybody but Japan. For same reasons we did. But worst thing would be if after our current Chief of State loses a trillion dollars worth of somebody Russian’s laundry and gets handed over by Vladimir to the DA in Passaic NJ. But precedent of stale CEO’s for president creates civil war between Elon and Howard Schultz. Hope Tesla’s got his car – which looks like a 1900 Mercedes, plugged in. We gotta escape to that cable streetcar project in Trieste. Yeah it’s Italy now but….read about Vienna in Mozart’s day. Aurora could fit tens of thousands of people, even under current zoning. The problem is family-sized housing for middle and low income people isn’t profitable enough for developers to bother. As long as luxury high-rise studios rake in the dough that’s what they’ll build. I’m not sure what the solution is but it’s pretty obvious the ‘free market’ is failing, not just here but all over the country. The thing is, the housing market is about as far from “free market” as you can get. There’s government intervention in almost every aspect. Builders don’t hate low-income folks. They just can’t buy land and build cheaply enough to make the rents pencil out except at much higher levels. Land is too expensive in part because local governments restrict supply (zoning) and the federal government encourages demand (homeownership subsidies). Nothing really operates in a free market and we can argue back and forth all day about the merits of that. Land will never be cheap enough when demand is basically infinite and land is scarce. This isn’t a commodity in which supply/demand can equalize unless the economy crashes and people start moving away. There’s no natural scarcity. If we had Chicago’s zoning we’d have plenty of housing, at both high and middle income levels. 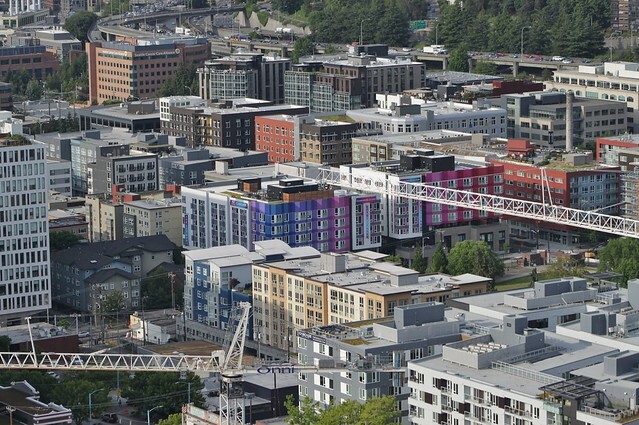 Low-income people will always need subsidized housing. The working class and lower middle class had affordable market-rate housing in the early 2000s and could have it now if zoning hadn’t prevented supply from keeping up with demand. The reason rents skyrocketed in the early 2000s and went into hyperdrive in 2010s was scarcity: the number of people competing for each unit increased, and with the second wave new wealthier competitors appeared. Prices are sticky on the down side because nobody wants to take a loss, so it’s easier to head off rent increases when they start than to try to reverse them afterward. First we need to get rents to level off before we can worry about decreasing them, and that means we’ll have to give housing subsidies to an income level we previously didn’t need to. That’s another societal cost of forcing rent increases through restrictive zoning. Aurora Avenue allows some development but its zoning is still stunted and in flux, and one block away is single-family only so that prevents a more walkable and attractive 2-dimensional community from forming. On the doubled rate of pedestrian deaths: my gut reaction is the influx of newcomers and aggressive driving habits that come along with them may be a substantial reason. “Blame the newcomers” has been an effective strategy in Seattle for at least 25 years. Hell, it’s probably been the lazy excuse for a hundred years now. I tend to believe there are a lot of inattentive drivers who were born in the city. Or at least born somewhere in Washington State or the Pacific Northwest and thus proudly claim themselves to be native. It’s been a strategy. How effective it’s been is another question. The increase is across the board everywhere in the US. It’s almost certainly a symptom of distracted driving. Don’t make the mistake to believe that it’s only distracted driving. I put at least equal blame on the cyclists and pedestrians who walk across streets without looking, which I see multiple times a day. And then cyclists who run stop signs, run red lights, etc, which I also see even more times during the day. The most attentive driver is put in a tough spot when a pedestrian blindly steps into the road, even without a crosswalk, or a cyclist thinks they’re free from abiding by the rules of the road. A pedestrian should not cross the street without first getting eye contact, crosswalk or not. Noooo, Absolutely NO Eye Contact !! You must avert your gaze, lest the force field lose its power. Actually, having learned my pedestrian behavior in the bucolic NY metropolitan area, I have found that it’s impossible to do some serious jaywalking and weaving between cars. I swear sometimes drivers are intent on showing how SUPER POLITE they can be, and if need be, stop 1/2 block away, even if I’m jaywalking, to show their righteous nature. Seriously, instead of seeing a bigger picture, that if they drove as if I was an adult with sensible skills, that I’m waiting for them to pass…. I find myself turning away from my intended path, looking around and whistling …. until they are past the point of no return. And I’ve even been in the middle of the sidewalk, not the edge. I’m about to resort to letting them know I think they’re #1 in my book. Agreed re the primary cause of distracted driving. Perhaps our zero enforcement strategy regarding traffic laws plays a part too. On days I take the bus I’ll sometimes tally how many drivers are looking at their phones as they pass by. Usually I have to stop before long though because it is absolutely infuriating (and scary) how many selfish people are paying absolutely no attention to their surroundings so they can like a few more Facebutt posts before work. I often count 40%+ selfish, inattentive drivers. I’m sure they would all agree that the real problem is bike lanes. As I mentioned above, don’t fall into the trap of believing that only drivers can be distracted. Bad behavior knows no mode split. But the reality is we have given up, as far as I can tell, on enforcing…anything. Folks ignore simple and basic traffic laws with impunity because…why not? Couple that with minimal education campaigns and ongoing engineering struggles, and here we are.